From your average joe who goes to the gym, to NFL superstars, the value of cannabis for exercise is increasingly being recognized. No other substance in the market can naturally treat the pain felt by those who are constantly exposing their body to rigorous physical activity without side effects other than cannabis. Aside from treating pain, cannabis is also valuable as a natural performance enhancer. 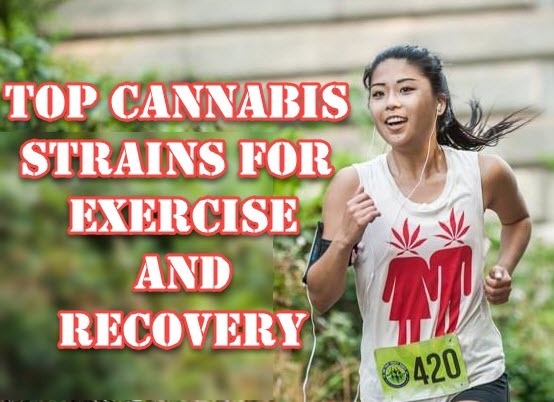 There are several reports of people who have successfully used cannabis to help them with fitness and weight loss regimens and even training for marathons. The right cannabis strain can also support your exercise regimen by helping you fight fatigue and anxiety, the exact opposite of the lazy stoner stereotype being spread by prohibitionists. Bruce Banner is a sativa-dominant strain that delivers swift, energizing, and heady effects. You’ll feel the impact of Bruce Banner almost instantly, although this complex high THC strain is felt in different layers. Once you feel the initial high, it will send you into a more mellow high, making it ideal for medicating right before you jump on the treadmill. Start off and finish strong with Bruce Banner, it might just make you feel like the Incredible Hulk in strength and endurance. Harlequin is a popular sativa-dominant hybrid loved by athletes and gym-goers alike. Harlequin has a high CBD content that provides relief from the psychoactivity of its THC content. Users love Harlequin because it delivers mild relaxing effects, which many find just right for staying active minus the anxiety. Harlequin is recommended for use before you start lifting weights as it lets you relax, stay focused, and have energy to continue for several reps after. Jack Herer is an internationally recognized strain that guarantees an uplifted, happy, and euphoric effect which will help you battle laziness and give you motivation even if it’s the much-dreaded leg day. Jack Herer will motivate and energize you naturally while delivering a clear-headed and blissful high. In fact, one of the characteristics that sets Jack Herer apart from other strains is the intense body buzz it delivers. Users love this about Jack Herer as everything is magnified, and when you need serious concentration for your workout this strain will do the job like no other. Jack Herer is ideal for aerobic forms of exercise as well as those that test your flexibility such as yoga and pilates. Sour Diesel is a powerful strain with a high THC content, suitable for mindful exercises such as yoga. However, it’s also extremely energizing that will melt pain and stress away; making it the ideal companion for high-intensity exercises such as boxing, martial arts, and spinning. Because it’s also extremely effective in treating pain, you won’t feel as sore post-workout when you medicate with Sour Diesel before, during, or after your session. Many users love medicating with Sour Diesel at the start of their day to boost their energy, creativity, and mental well-being. This strain is recommended for those who struggle with going to the gym and who need a little help overcoming fatigue. Cannatonicis a unique strain for its high CBD content and vast range of medicinal properties. You’ll barely feel a high, if any, when medicating with Cannatonic. If you’re new to mixing cannabis and exercise, this is a good strain to start with. It delivers a short-lived yet mellow high that is equally uplifting, recommended for use if you’re navigating the great outdoors as you exercise. If you’re into rock climbing, mountain biking, hiking, or other outdoor activities as opposed to the gym, Cannatonic will give you the focus and energy that you need. Athletes also love Cannatonic because of its powerful abilities to treat pain and muscle spasms that often occur with rigorous workout sessions. When it comes to productivity in exercise as well as other tasks, the strain of cannabis used as well as the amount play an important role. If you’re used to smoking entire spliffs, you’re probably better off microdosing otherwise it might have the opposite effect.